ML-Rules is a rule-based language for multi-level modeling and simulation. ML-Rules supports dynamic nesting of entities and applying arbitrary functions on entity attributes and content, as well as for defining kinetics of reactions. 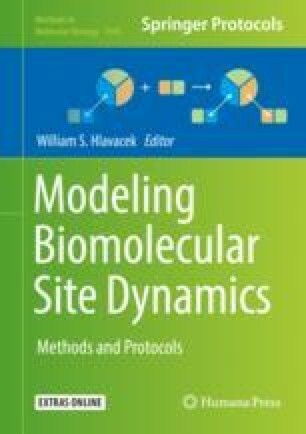 This allows describing and simulating complex cellular dynamics operating at different organizational levels, e.g., to combine intra-, inter-, and cellular dynamics, like the proliferation of cells, or to include compartmental dynamics like merging and splitting of mitochondria or endocytosis. The expressiveness of the language is bought with additional efforts in executing ML-Rules models. Therefore, various simulators have been developed from which the user and automatic procedures can select. The experiment specification language SESSL facilitates design, execution, and reuse of simulation experiments. The chapter illuminates the specific features of ML-Rules as a rule-based modeling language, the implications for an efficient execution, and shows ML-Rules at work.